For displays that support resolutions above 4K, our DisplayPort version 1.4 cables provide the solution. 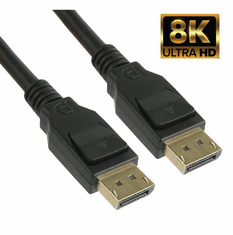 DisplayPort v1.4 cables support a maximum bandwidth up to 32.40Gbps (HBR3 - High Bit Rate 3 mode) with added support for Display Stream Compression 1.2 (DSC). This combination allows support for 8K / 60Hz (7680x4320) or 5K (5120x2880) / 120Hz resolutions (Note: Without DSC, the resolutions are the same as DisplayPort 1.3 (8K / 30 Hz, 5K / 60 Hz, 4K / 120Hz). Up from the previous generation, the number of audio channels has also increased to support up to 32 audio channels. Support for HDCP 2.2 is also included. HDR (High Dynamic Range) is also supported for deeper blacks, greater contrast, and more lively colors. DisplayPort version 1.4 supports higher resolutions when compared to previous generations. This allows 8K / 60Hz, 5K / 60Hz and 4K / 120Hz resolutions (Note: When DSC in use), with added support for HDR (High Dynamic Range). Our DisplayPort cables are VESA certified to meet version 1.4 compliance and standards. For reference, the table below shows the full specifications of DisplayPort 1.4.